Leather * Heated Seats * Pano Roof * Navigation * Alloy Wheels * Backup Camera * Parking Sensors * One Owner * Thank you for visiting another one of Apollo Auto Sales 's online listings! 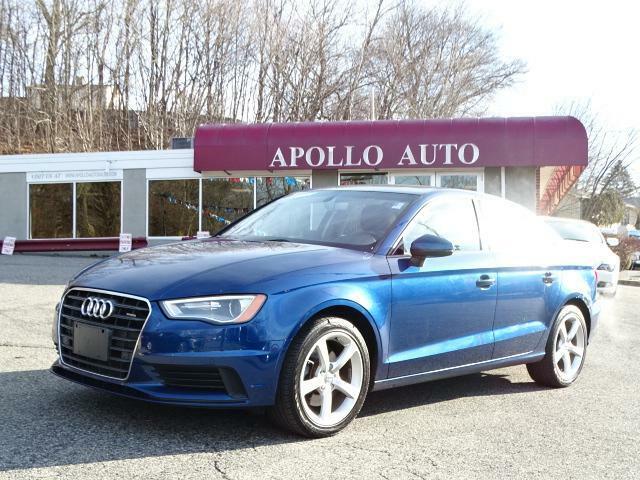 Please continue for more information on this 2016 Audi A3 2.0T Premium with 78,186mi. The Audi A3 2.0T Premium speaks volumes about it's driver, uncompromising individuality, passion for driving, and standards far above the ordinary. It's exceptional fuel-efficiency is a clear sign that not all vehicles are created with the same standards. This vehicle has an added performance bonus: AWD. It improves handling on those winding back roads, and gives you added safety and control when driving through wet and snow weather conditions. More information about the 2016 Audi A3: The Audi A3 competes against other compact premium cars such as the BMW 2-Series, the Mercedes CLA and, to a lesser extent, the MINI Cooper. In past decades, owning a small car meant dealing with little more than bare bones transportation. These days though, owners of small cars need not be deprived of anything, and the A3 looks to continue that trend by offering a vehicle with a small footprint but with luxury-car performance and amenities. The A3 starts under $31,000. Strengths of this model include clean styling, three body styles, including convertible, upscale feel, high-performance S3, Compact size, available all-wheel drive, and hybrid model Apollo Auto Sales has been in Business Since 1972. We Specialize in Late Model-Low Mileage-Fully Serviced Vehicles. Apollo Auto Sales practices a Velocity Based Pricing Strategy which provides a Transparent Sales Process and Excellent Overall Customer Experience. Please Call Us to Check Availability and to Schedule your No Hassle-No Obligation Test Drive!! Call 401-728-8998 or Click: www.apolloautosales.com.